Control technology: Advanced 32-bit MPU processing system. 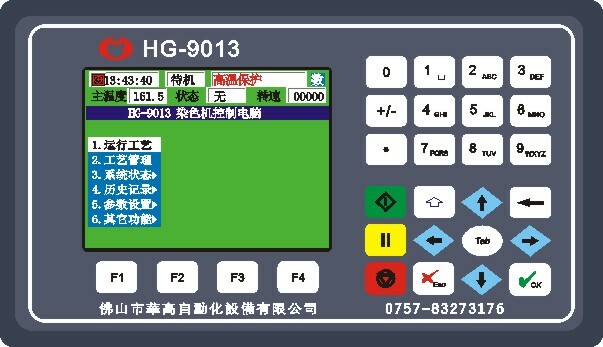 Display：It adopts 320×240 pixels 256-color bitmaps or monochrome display screen. Language：Both Chinese and English are available. Storage：It has a large storage space which can store 200 different processes, each process contains a program with 200 steps. It can also record 100 complete production process curves and 200 alarms. Data protection：It supports multi-level administrator password protections and IC card backup process and parameters; using IC card backup, transfer between machines can be easily achieved, ensuring complete and reliable process execution. Communication：It provides 2 communication interfaces, to connect a variety of PLC as well as the monitoring system. Temperature control mode：Temperature holding time for each step is 0-999min. It can control proportional valve precisely. Define：All of switching values, analogs and outputs can be customized.